North Korea isn't happy about the U.S. and South Korea conducting drills in the waters around the Korean peninsula. The U.S. and South Korea are conducting drills in the waters around the Korean peninsula. And, not surprisingly, North Korea isn't pleased. The North's Korean Central News Agency said Thursday, "The U.S. is running [amok] by introducing under our nose the targets we have set as primary ones." It added that Americans should expect an "unimaginable strike at an unimaginable time." 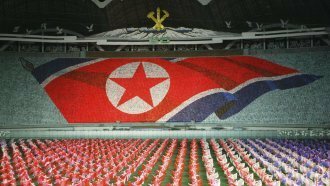 Related Story The EU Just Hit North Korea With More Sanctions — But Will They Work? The angry threat came not long after North Korea's deputy ambassador to the United Nations warned the situation on the Korean peninsula has reached "the touch-and-go point" and that "nuclear war may break out any moment." Pyongyang has made it very clear that it doesn't approve of the U.S. and South Korea's joint military exercises. And the most recent ones are no exception. But while North Korea's verbal threats seem to be escalating, there's been a noticeable lull in its missile activity. It's been over a month since the country launched a rocket.